You know how some countries become fashionable? Well the 1980s were all about Spain. The country had finally emerged from Franco’s dictatorship (he died in 1975). There was an explosion of creativity, best known perhaps in the work of Pedro Almodovar, director of ‘Women on the edge of a nervous breakdown’. Over in Britain, the newly revived Spain inspired artists, fashion designers and musicians. Rifat Ozbek designed an ornate bolero that even Princess Diana wore. Robert Elms, the radio broadcaster who was going out with Sade, wrote about Barcelona in every free issue, it seemed, of Girl About Town. Sade split up with Elms, moved to Spain, married a Spaniard and filmed some pop videos there, all tan leather and dusty hidalgos. Madonna wore a flamenco dress in La Isla Bonita. The mood, the vibe, the look, the sound-was Spanish. We also learnt, finally, that Spanish food consisted of more than just paella and grease. Up until the 80s most people associated Iberian cuisine with the ‘full board’ meals they got in their Torremelinos package holidays. My first London tapas experience was in Camden, Inverness St, at Bar Ganza. A while later El Parador started up near Mornington Crescent. Small earthenware dishes of boquerones, patatas bravas, pan con tomate y ajo and anchovy olives washed down with Rioja became a regular dinner out. Further up, towards Tufnell Park, there was a tiny Spanish restaurant where, downstairs, flamenco dancers and musicians would hang out until the early hours of the morning after their shifts at the tourist joints behind Oxford Street. In 1988 Monika Linton, opened Brindisa a Spanish food wholesalers, a shop in Borough Market and several restaurant branches. 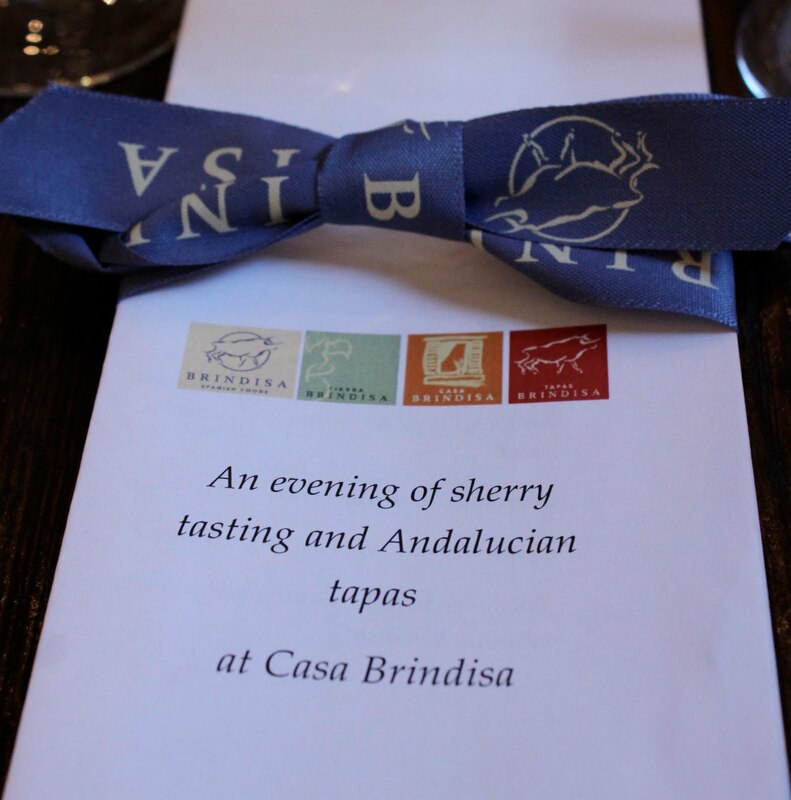 Food bloggers and journalists were invited to a busy and popular Brindisa in South Kensington to find out more about sherry. Readers of my work will know that I’m a fan of sherry, I even did a meal where each course was matched to a different sherry. The reputation of sherry as a serious drink is becoming enhanced with the backing of Heston Blumenthal (who even wrote a book about it) and specialist bars like El Pepito in Kings Cross. Peter McCombie took us through 11 or 12 sherries, ranging from dry, to resinous, even beeswaxy then sweet. The most interesting were called La Bota (the barrel), discovered by sherry fanatics who spend all their holidays in Jerez tasting from forgotten barrels. Peter disagreed with Heston Blumenthal; tests show that sherry contains no ‘umami’ in itself but achieves something known as ‘umami convergence’ when married with certain foods. 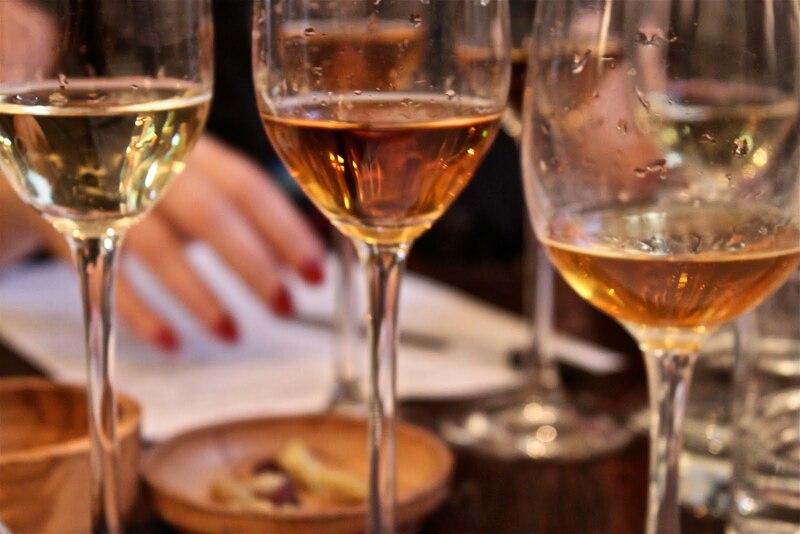 I often think sherry is a better drink with food than wine. These were matched with a small tasting menu. Stand out tastes include the pale green manzanilla olives; the ‘remojon’, orange and cod carpaccio salad with artichoke; a sardine in batter (didn’t think it’d work, being an oily fish, but the batter was so light); and a lovely sheep’s milk cheese, ‘oveja merina graza lemena’. Peter was entertaining and made the sherry seem approachable however I’m rubbish at tastings. Especially after I over-enthusiastically snorted a generous amount of Palo Cortado, which somewhat interfered with my subsequent sense of smell. I also get drunk very quickly* and end up saying stuff like “Peter, do you find that people stop listening to you after a while? ” and to Fiona St. George, the PR next to me, on the subject of fertility “I once held a mucus workshop at my house”. *Peter said 100 tastings without swallowing equals a glass of wine. I was swallowing. A great evening. I love sherry too. I wouldn't worry about the things you said. I blurted out to the whole room that I thought one of the sherries tasted like "a dusty carpet – in a good way". Oh well. Loving the poppies by the way.